It's the middle of December and I'll be arriving in Mendoza exactly two weeks from today - a couple days ahead of the rest of the team so that I have time to put the finishing touches on our logistics. Thanks to regular updates from our Argentinian logistics provider Inka Expediciones we already have a good picture of what the mountain looks like this year, and it ain't all that pretty... okay, well - it's pretty to look at, but promises to be challenging as far as the climbing conditions go. Take a look for yourself. To put these photos into context here's what basecamp looked like when I was there two seasons ago, which is much more typical for this side of the mountain. The current snow conditions should make for an interesting climb; where two years ago I could have tagged the summit entirely without crampons or ice axe (though I did carry them, as is required by the park administration) there won't be much of a question about gear requirements this time around. And the ramifications extend below basecamp, too: the 25km approach to Plaza de Mulas follows the Horcones Valley which has a river flowing along it - in low snow years it is possible to crisscross back and forth without having to get your feet wet; in a season like the current one we are certain to have multiple river crossings that'll get us soaked. 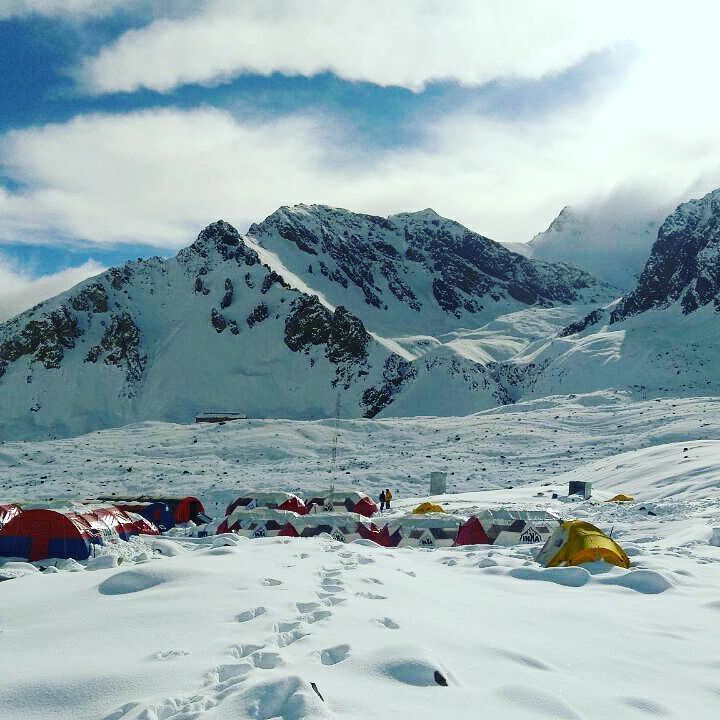 At least we won't have to worry about procuring drinking water above basecamp; there's plenty of snow to melt everywhere!